If you are looking to have someone keep you posted on the latest changes in the financial markets, the economy, interest rates, world news, and investment information, then we recommend signing up for our free newsletter. InvestorTips Quarterly will help you enhance your investment and retirement decision making abilities. It is highly recommended for seniors, pre-retirees, retirees, as well as, for the mature investor. Changes in the different stock market indexes such as the S&P 500, Nasdaq, Dow Jones, MSCI Internation Index, etc. Changes in interest rates and inflation. Changes in investments, such as, Mutual Funds, CDs, Annuities, and more. Changes in the IRA tax code and IRA distribution options. Successful IRA strategies that can be applied to Traditional and Roth IRAs. 401k planning while currently employed, and 401k planning for retirement. Strategies to help lower your taxes and which investments may be best. How each investment class has performed recently such as, SmallCaps, MidCaps, LargeCaps, Bonds, etc. Changes in estate planning concepts and strategies. There is no reason to be left in the dark. We spend countless hours and energy trying to keep our clients and prospective clients educated and informed on what they need to know about their finances. There is a plethora of information going around, and it can be very time consuming trying to figure out what you should focus on, which topics are most important, and which issues will affect investors the most. InvestorTips Quarterly is nothing more than a nice, brief, summarization of all the topics we feel you should focus on the most. Our job is to read all of the boring financial material that most people do not want to bother with, then summarize it for you into one 4-page newsletter. Surprisingly, it is our free gift to you for visiting our site. There is absolutely no charge or obligation to join. Join InvestorTips Newsletter Now... It's Free! 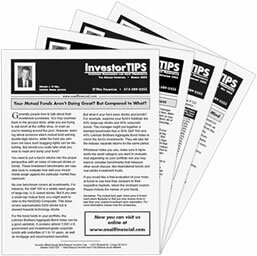 Fill out this form to begin receiving InvestorTips Newsletter (sent out quarterly). Our newsletter is for Michigan residents only. © 2009 OneilFinancial.com. All Rights Reserved. Securities and advisory services offered through Cetera Advisors LLC, member FINRA/SIPC. Cetera is under seperate ownership from any other entity. Investment products and advisory services from these registered representative(s) available only to residents of California (CA), Florida (FL), Illinois (IL), Maryland (MD), Michigan (MI), and Wisconsin (WI). Cetera Advisors LLC, is licensed for securities and advisory services in all 50 of the United States, but the registered representatives are licensed only in the states of CA, FL, IL, MD, MI, WI. Products and services mentioned in this web site may not be available in all states or jurisdictions. To request a prospectus or information, contact at 800-353-7114.